How to activate your thymus and increase your life energy. Written in response to thousands of requests, this basic book gives a general philosophy as well as techniques useful in evaluating all factors which influence the health of the individual. This book is a classic of its kind. Although it is probably best known for its discussion of the kinesiological muscle test, it is ultimately more important for showing that stimuli, whether physical or otherwise, effect our Life Energy constantly for better or worse. Furthermore, these effects tend to be the same for all observers: uncousciously, this painting, that food and so on all effect us the same, regardless of what we think in our conscious minds. This, of course, is a remarkable discovery, and the implications of it have been explored more fully by Dr. Diamond in many of his subsequent works. In short, this has to be one of the most important health books of the twentieth century. Invaluable … useful to the physician in helping the patient, and an enormous help to the public struggling to maintain vitality and well-being in an increasingly stressful world. 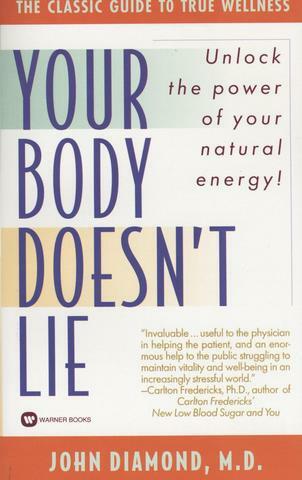 Your Body Doesn’t Lie is a short self-help manual on how to restore your body to its maximum potential. Illustrated with several black-and-white photographs and drawings, the text is accessible and a pleasure to read. It is highly recommended for all those who wish to assert their right to health and well-being to the full.